Ireland's Leading Smart Home & Automation Company We have designed and installed home automation systems in homes in the North West of Ireland including media systems, lighting controls and home security. Contact us today for a quote on +353 (87) 2250 599. Home automation or smart home technology gives you the freedom of controlling the features in your home through the touch of a button on a central console, smartphone or tablet. Smart home automation systems allow you to easily control heating, lighting, security and more from one simple interface. Digitel offer automation systems for your home from the top brands in smart technologies. We design and install solutions around your requirements and to meet your requirements. Our lights and heat controls systems make it easy for you to adjust the comfort in your home. Contact us today for a control system quote or click to download your free brochure. Call the family to dinner. Create a virtual bulletin board for your family. Enjoy audiophile sound for music, movies, TV. Get an unlimited supply of music from the Cloud. Keep an eye on the heating bill without working at it. Turn up the heat before you get home from a trip. Remotely access and control your holiday home. Make sure the kids are safe and at home. Look around the house, even when you are not there. 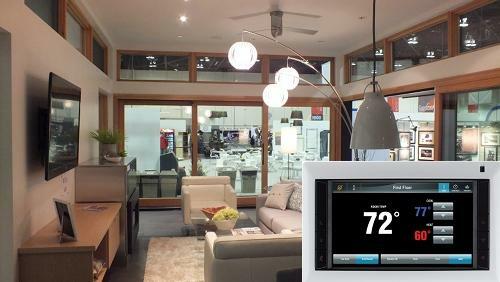 Whole house automation systems are also available to make your home a smart home. View the plan below of a smart home with a whole house automation system.